The purpose of Senator Warren’s visit was to tour the health service facility, and participate in a roundtable discussion (which was closed to media) on the Comprehensive Addiction Resources Emergency (CARE) Act which she and Representative Elijah E. Cummings (D-Maryland) introduced this week. U.S. Rep. William Keating, D-Mass., and Mashpee Wampanoag Tribal Chairman Cedric Cromwell have responded to concerns outlined in a letter from Mashpee selectmen about federal legislation aimed at reaffirming the tribe’s reservation, saying the bill would further protect commitments between the two governments. Budget Vote on May 20, 2018 from 2:00 p.m. to 4:00 p.m.
All enrolled and eligible-to-vote Tribal Members are allowed to register on or before the day of the Annual Budget Vote on May 20, 2018 from 2:00 p.m. to 4:00 p.m. All registered voters must have a valid federal, state or Mashpee Wampanoag Tribal issued photo identification to vote. The Tribal Historic Preservation Department needs Cultural Resource Monitors (CRMs). This work will be contractual, on an as needed basis. This is a great opportunity for Tribal members that are interested in our culture. Applicants should be experienced with the outdoors through hunting, fishing, map reading and demonstrate cultural knowledge. THPD has gone paperless in data communications; successful candidates must be ready or willing to learn digital file sharing, and computerized field equipment. The training will increase your traditional cultural knowledge to help you comfortably represent the Tribe on site. Opinion by Paula Peters: Is it 1976? The Mashpee Wampanoag Tribe is seeking job applicants for the following position: Human Services/ICWA Caseworker. This position is within the ICWA Department and will report to the the ICWA Director. This is a full time, non-exempt, hourly position with a range of $23.01 - $35.42 hourly (commensurate with experience). The Mashpee Wampanoag Tribe Education Department has posted a comprehensive list of financial aid scholarship opportunities for Native Americans. The page includes links to each opportunity and is broken down into sections making it easy for tribal members to find the financial assistance that is right for them. Opportunities include those specific for Native Americans, general financial aid resources, general scholarships, Cape Cod Community College and adult and GED assistance. The Mashpee Wampanoag Tribe Workforce innovative and Opportunity ACT (WIOA) Department is pleased to announce that tuition assistance is available for Mashpee Wampanoag Tribal Members that are currently enrolled in a college or university. We’ve received lots of feedback on the new Mittark...some good and some constructive criticism. We’ve been told on a number of occasions that some people would like to print out full articles. We agree and will now make a full PDF of the Mittark available at www.mittark.com that will be easy to print out the full articles. Each year the Association of Native Alumni at the University of Pennsylvania select one student to receive the Student Leadership Award. This year the organization selected Keturah Peters, senior in the nursing school, as this year’s recipient. Keturah Peters, a senior in the nursing school at the University of Pennsylvania, has attended seven Ivy Native Conferences throughout her collegiate career. However, this year’s Annual Ivy Native Council Spring Conference was particularly special for the soon to be graduate. Natives at Penn (NAP) – an organization that Keturah is closely involved with – had been selected to host this year’s conference. The Mashpee Wampanoag Tribe Indian Education office invites you to attend a Public Hearing to gather input and recommendations on the school districts Title VI Indian Education grant application. The Mashpee Wampanoag Senior Travel Club will be hosting a Psychic Fair on Saturday, May 19 from 10:00 a.m. to 3:00 p.m. at the Mashpee Wampanoag Tribe Community and Government Center. The Psychic Fair is open to the public and ickets to enter the fair will be $2.00 and may be purchased at the door. Readings will be $20 per reader. The walking club will begin on Monday May 7th and will meet twice a week at 11:00 a.m. on Mondays and Thursdays. The course will be on the paved surface of the Tribal grounds around a circular route. Participants will meet in the main lobby at noon as the designated start location. Pedometers are available for those who are interested in measuring their distance. Sponsored by Harwich Conservation Trust, join 12th generation Cape Codder Todd Kelley and Wampanoag/Nipmuc Marcus Hendricks on one or all of these leisurely late afternoon walks. Along the way they will share many stories of insight into Native life on Cape Cod from before European contact through early settlement of “old Cape” families. It was discovered that the old ways of justice for the Navajo tribe were still being practiced “in the corners.” No one recognized that what they were doing was “alternative dispute resolution.” Some of the tribal people did what they had always done. A woman called and asked “what is peacemaking?” After it was explained to her, she remarked, “oh that, we understand.” An example was given of a case on which was heard in Crownpoint. 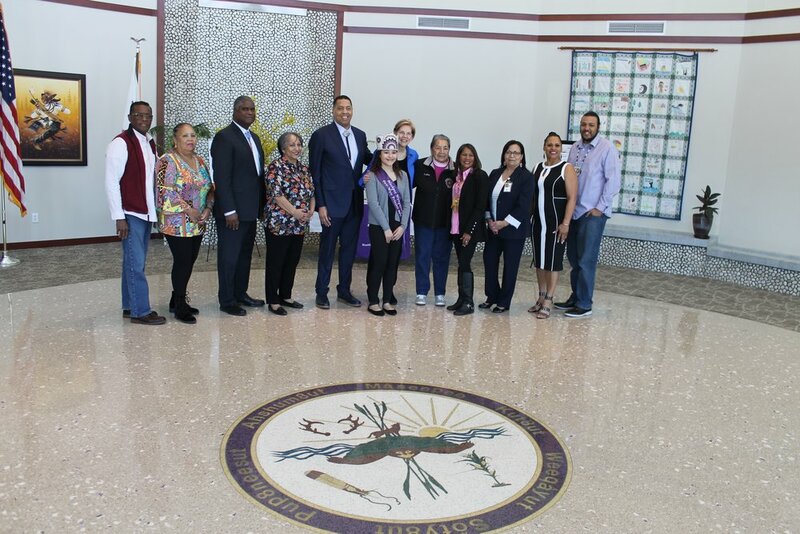 The Mashpee Wampanoag Tribe Emergency Management Department (MWT EMD) is promoting a new program designed to educate and empower the public to take action in emergency situations and provide lifesaving care before professional help arrives. The Until Help Arrives program is available online at https://ready.gov/untilhelparrives. Injuries can happen at any time. In fact, you never know when you might find yourself in a situation where someone, a stranger perhaps, needs immediate medical help for a life-threatening injury. You are the most important help available to someone with a serious, life-threatening injury. The Mashpee Wampanoag Tribe Emergency Management Department has collaborated with the American Red Cross on a home fire campaign that is continuing to deliver and install free smoke and carbon monoxide detectors in the homes of Tribal citizens within our community. The campaign launched in 2017 and since then an additional allotment of new smoke and carbon monoxide detectors have been made available. Mashpee Police Department continues to see scams involving the purchase of a gift card. A legitimate company will never ask you to purchase a gift card as a payment. If you have any questions regarding the legitimacy of a call, please contact Mashpee Police Department.